Have You Ever Picked A Carrot? : The Great Uhh...Scape?? Well that's clearly not true, but it was quite tasty and I'm always up for trying new things at the farm. I'm the kind of guy who likes to make sure I experience something before I shoot it down. Sometimes you have to learn the hard way, but it's usually worth it. Today, everyone told me "J, you really shouldn't wear corduroy pants in 90 degree weather" or "you sound like an idiot saying that you want to wear black corduroy pants today just because you've worn them every weekend for the last 8 months," well you know what I say to all those naysayers...You were right! It was a terrible idea and to all you kids out there, I highly recommend using logic to avoid heatstroke in the summer. With the market just hours away, there was little time to mess around. The Captain took us right out to the fields to get picking, but even under the gun there is always time to quickly admire the beauty the farm has to offer, just take a look here. The young garlic plants are growing strong and as their bulbs harden, a long, thin, flowering garlic shoot pops up from the bulb. This shoot is called a scape which contains the garlic plant's seed inside. Over time the scape curls and flowers. This requires a lot of energy, so to maximize your garlic's potential, it is best to remove the scape, sending all the energy back down to the bulb where the garlic cloves can flourish. Another bonus is that the scape is delicious and profitable. In addition to benefiting from the future garlic production, the farm also sells these popular leftovers at the market. 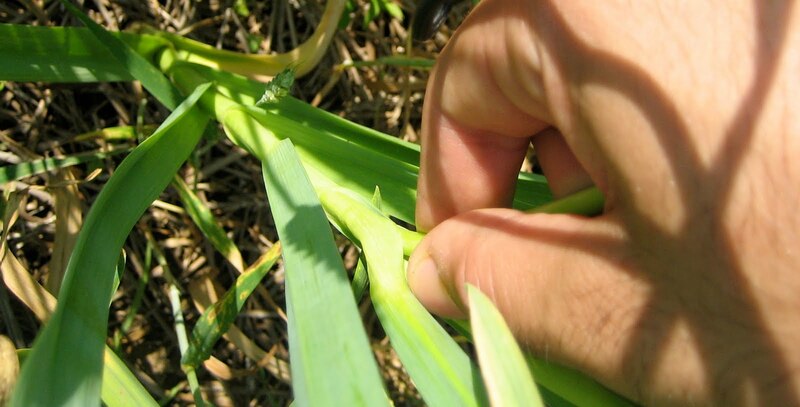 It is important to remember to remove the scape while the garlic plant is still fairly young. As the plant develops, the scape will harden and turn a white color similar to garlic you see in stores and markets. When the scape reaches this stage, it loses its flavor and usefulness in the kitchen. The Captain taught us the gentle process of removing a garlic scape and it proved to be something of an addiction. In its simplest form, you want to grab the scape as far down as you can and gently pull until it releases from the plant. The tricky part is not breaking off too early as you want to get the longest scape possible. Many times when you remove the scape a tiny water bubble will form, which tastes of fresh garlic. You can even chew the raw scape as the garlic flavor is significantly less pungent than the actual clove. When you pluck an entire bed of scape you want to make sure to place them all facing the same way. This is an efficient way of organizing, not only for the functionality of holding them as you go, but because the harder, flowering top portion of the scape is generally removed during cooking as well. We placed them all in a bin, loaded up the truck and headed for the greenhouse to weigh and tie them. Today, we tied 1/2 pound bundles with twine and brought them up to the market for sale. Matt, using charm coupled with his newly acquired scape expertise, wooed this innocent woman into buying some. Pretty good for a first-timer. Garlic (Allium Sativum) is a member of the Alliaceae family along with onions, chives and leeks to name a few. There are many health benefits of garlic and the scapes can easily be turned into a pesto or even grilled on their own to eat. These only come around for a short period of time each year, so I would jump on the opportunity and head to your local farmers' market as soon as possible.